A piece of thin board, or shingle, is cut to the shape of a boat and two standards are fastened to it. The standards have notches cut in them to hold an ordinary baking-powder can which is used for the boiler. The lid of the can is soldered on, and a small hole punched in one side with an awl. Two candles are used to heat the water. The turbine is constructed on an axle made of a hatpin which runs through the top of the standards for bearings. The paddles are made of cardboard, or better still, pieces of thin sheet tin, cut and bent as shown at A, and three of these are attached to a three-cornered block of wood fastened to the shaft, as shown at B. The manner of attaching the shaft for the propeller is shown at C. The propeller consists of a piece of tin, slightly twisted and attached to the shaft with solder. 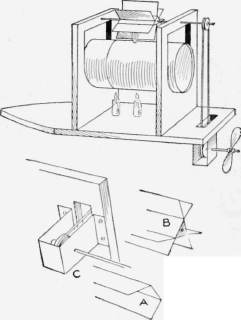 The pulleys are located as shown and connected with a string band. The hole made in the can should be pointed to one side of the turbine shaft so that the escaping steam will strike one side of the paddles on the turbine. - Contributed by McKinley Wood, Ava, N. Y.